Macaron Day NYC is upon us (March 20), and with it, the promise of sweet, sweet indulgence. Now in it's fifth year, this great holiday was launched by Francois Payard, French baker extraordinaire, to raise awareness of the sweet treat. (Bless him!) This year, there's another reason to celebrate: free, yes free, macarons. (One complimentary per person at each bakery). Twelve participating bakeries are involved, and the day also marks the official start of Spring. A portion of all proceeds will be donated to City Harvest. It was crunchy on the outside and soft on the inside. In the 1830s, the macaron shells began to be assembled two by two, and topped with jam, spices or liquors. The country has long been an exporter of Almonds. That's when Pierre Desfontaines, second cousin to Louis Ernest Laduree, put two cookies together, around butter crème, jam, compote or ganache. The colorful macarons we know today became more prominent as Laduree's bakery, La Maison Ladurée, began selling many and creating unique flavors. Payard's recipe for 50 macarons calls for 3 1/2 cups of confectioners' sugar, 2 cups of sugar, 6 ounces of chocolate (varying degrees of cocoa), 4 1/2 teaspoons of light corn syrup and 1 cup of heavy cream. 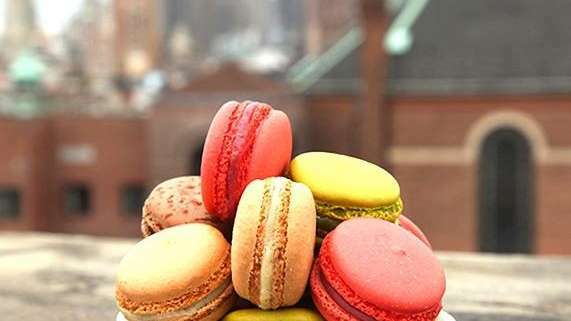 Payard's Bakery on Houston Street churns out 12,000 macarons per day. Bouchon Bakery sold one million macarons last year.